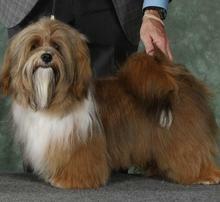 Everspring Dogs - The Home of Champion Havanese Dogs. 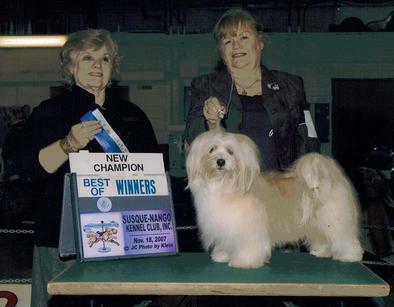 Our Vegas co-owned with Terri Bergan of Sedosos Havanese has finished his AKC and CKC championship. My name is Joanna Swayze. Welcome to my website. I hope you enjoy viewing my dogs and available puppies. Feel free to contact me. I have had dogs all my life, but after my daughter left home after completing college, I started obedience and agility training with my German Short Hair Pointer. I discovered the wonderful world of dogs and dog people. I had found a new life for myself. A friend introduced me to Portuguese Water Dogs. I fell in love with the breed. I started showing my own dogs in conformation and then breeding. That was approximately 20 years ago. Then I fell in love with the wonderful Havanese over 10 years ago and now show and breed these happy dogs. 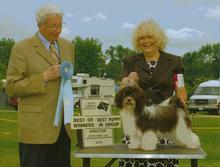 I am a member of the Canadian Kennel Club and the Havanese Fanciers of Canada I breed for health and temperament. I am now retired and live in Tweed which is just north of Belleville, ON. You can contact me for further information or an appointment to view my dogs and puppies. We have puppies. Please click on the link here to see photos of available puppies, or go to our puppy page.